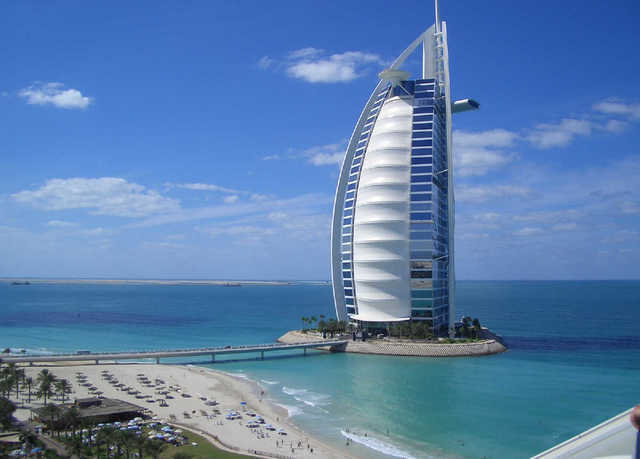 The Burj Al Arab is a luxury hotel located in Dubai, United Arab Emirates. It is the third tallest hotel in the world (although 39% of its total height is made up of non-occupiable space). Burj Al Arab stands on an artificial island 280 m (920 ft) from Jumeirah Beach and is connected to the mainland by a private curving bridge. The shape of the structure is designed to resemble the sail of a ship. It has a helipad near the roof at a height of 210 m (689 ft) above ground.